The aurora borealis is a quintessentially Canadian space-weather phenomenon, one shared with other high latitude cultures. 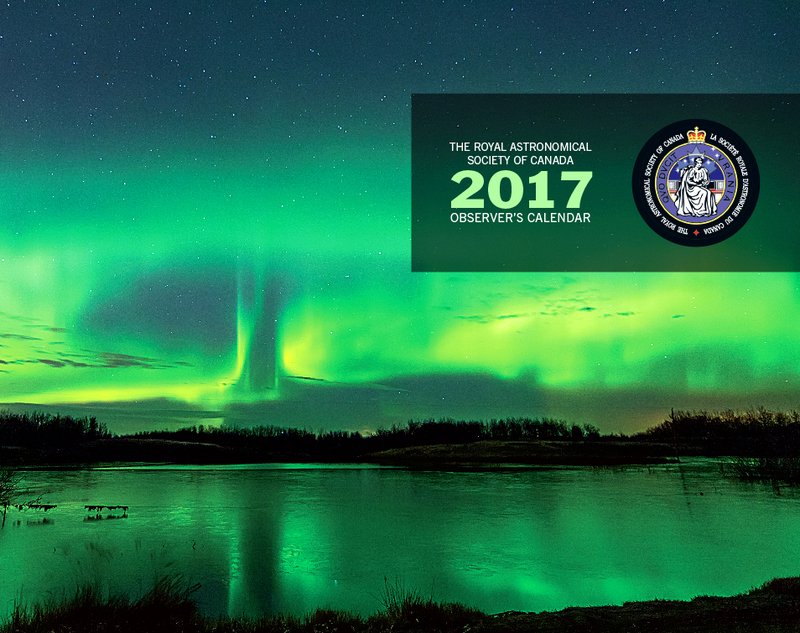 RASC members have contributed to the scientific, historical, and artistic investigation of the northern lights, and have promoted their recreational enjoyment. The Manicouagan astrobleme (214 ± 1 Ma) represents the major discovery of sites of impact cratering in the Canadian Shield, an effort pioneered by astrophysicists and geophysicists at the Dominion Observatory (ca. 1950-), many of whom were RASC members. This world-impacting research played a crucial role in changing scientific and popular perceptions of crater-forming mechanisms, solar-system history, and planetary geology. The representation of the crater also acknowledges Canadian excellence in meteor dynamics, meteorite petrology, meteorite curation, and the RASC's long-standing interest in such work. The stars represent the major Canadian contributions to stellar spectroscopy done at the Dominion Observatory, the Dominion Astrophysical Observatory (also see this), the David Dunlap Observatory,(additionally refer to this) and elsewhere (ca. 1905-), whose major contributors were also RASC members (such as J.S. Plaskett [1865-1941], the first Canadian astrophysicist of international repute). The stars also symbolize the asteroseismology, exoplanet transits and eclipses, and investigations into stellar variability through precise photometry achieved by the Microvariability and Oscillations of STars space telescope (MOST, 2003-). The globular cluster recognizes the field of Helen Sawyer Hogg's (1905-1993) greatest scientific contributions (ca. 1926-ca. 1993), and the Helen Sawyer Hogg Telescope (HSHT) at the University of Toronto Southern Observatory at Cerro Las Campanas, one of Canada's first ventures (1971-1997) in exploring off-shore astronomical installations, which has born lasting fruit in international cooperative installations exploring the full range of astrophysical phenomena, such as the Canada-France-Hawaii Telescope (CFHT, 1979-), the James Clerk Maxwell Telescope (JCMT, 1986-2015 [period of direct Canadian involvement & funding]), the Gemini Telescopes (North 1999-, South 2000-), the Atacama Large Millimetre Array (ALMA, 2011/2013-), the Square Kilometre Array (SKA, 2020-), and the Thirty Metre Telescope (TMT, ca. 2022-). The spiral galaxy represents both the work of Canadian observational cosmologists (e.g., Sidney van den Bergh's classification of Galaxy morphology, Laura Ferrarese's work on the morphology & dynamics of early type galaxies), as well as the efforts of amateur Canadian observers of deep-sky objects (DSOs), and imagers. The comet stands for the contributions to cometography by Canadian comet discoverers, such as David Levy, Rolf Meier, and Chris Wilson. The Moon symbolizes an object important for first nations' calendrics, and the earliest recorded observations by Europeans in Canada (17th century lunar reports, and lunar eclipse reports). The Moon together with the stars symbolizes the practice of navigational astronomy on land and water, which was crucial to the formation of Canada. Finally, the Moon is as popular an object for RASC members to share with the public when doing outreach as it was 150 years ago.